The southeastern tip of Brunswick County is located at the South Carolina state line, making a trip to the tourist mecca of Myrtle Beach an easy ride. Myrtle Beach offers several major outlet malls, restaurants, shopping and family attractions. There are also several concert venues making for a great night out before heading back to relaxation in the Brunswick Islands. Wilmington is a historic river town that is located to the north of Brunswick County and offers a large register of historic homes and a downtown riverfront. You will also find lots of restaurants, shopping and a booming nightlife in this city. 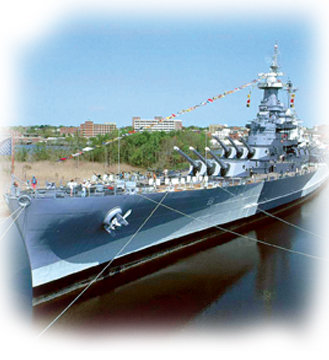 Another attraction located in Wilmington, is the Battleship NORTH CAROLINA, from World War II, which rests on the banks of the Cape Fear River. If you are in the area, you should also visit the Cape Fear Museum, Thalian Hall and Screen Gems Studios. Calabash is the southernmost river town in Brunswick County, creating the perfect location for the first Calabash restaurant, an oyster roast that was in a shed and opened in 1935. Today, Calabash is known as “The Seafood Capital of the World.” This river town also offers a variety of specialty stores and art galleries.Calabash was incorporated in 1973. At that time, Calabash was a small fishing village with a handful of seafood restaurants. We have since grown into a small town with a year-round population of 1,868 residents. Currently, there are over 30 restaurants in town serving people from all over the world each year. The Mayor and Board of Commissioners invites you to explore our website and learn everything you would like to know about our beautiful town; from our history, which began as early as 1691, to current events and future plans. Carolina Shores is located just outside of Calabash and is a planned community of mostly retirees. This town features an 18-hole golf course and is beginning to grow with new merchants and restaurants.The residents of the Carolina Shores Golf Course Community originally made up the Town’s population and consisted of an 18-hole golf course, clubhouse, and amenity center. The residential area adjoining the golf course consists of single family homes, patio homes, gate homes, and villas. The Acreage Estates section consists of one acre single family lots. The Town of Carolina Shores has seen enormous growth in the past ten years and has graciously welcomed the additional areas into the town limits. stadium-seating movie theatre. Shallotte is also the home of the Brunswick County Chamber of Commerce, which is located on Main Street. The town’s population of 3,700 is deceiving as Shallotte is the spot where residents and visitors from miles around come to shop, dine and enjoy entertainment. Shallotte is about 10 minutes from Holden Beach, Ocean Isle Beach and Sunset Beach. Within the town’s 28 square-miles there are more than 610 business. Bolivia is approximately in the center of Brunswick County and houses the county seat. Brunswick County contains a centralized county complex that lies in Bolivia. St. James is a gated golf community that was incorporated in the late 1990s. This town is located in the eastern portion of the county, close to Southport, which offers shops and businesses. St. James started as a retirement community, but now enjoys no age restriction. Southport is a historic fishing town located at the mouth of the Cape Fear River on the Atlantic Ocean. Riverboat captains settled and incorporated this city in 1805. Southport features a downtown riverfront that contains numerous antique and specialty shops. Visitors can also browse by the restored Victorian homes, many of which are claimed to be inhabited by spirits, and see great views of Old Baldy Lighthouse and Oak Island Lighthouse by taking a historic walking tour. Southport, situated along the shores of the Cape Fear River and Intracoastal Waterway at the river’s mouth of the Atlantic Ocean, is a city rich with history. The ocean, river, and waterway provide a unique abundance of opportunities for outdoor, recreational pursuits. Much of Brunswick County’s growth has been seen in Leland, the largest of the County’s northern towns. Leland has an active commercial district, including several restaurants, stores and professional offices. The town has also gained new golf communities recently. If you adventure off into Brunswick County’s countryside, you will find the towns of Belville, Sandy Creek, Northwest and Navassa along with some of Brunswick County’s small town charm and personality.